An individual very special to Jackson Academy visited last week to see the innovation taking place at the school she helped found. Doris Brickell and her late husband, Hershel, were among 10 families involved in the founding of Jackson Academy in 1959. These families, working with educator Loyal Bearss, decided to establish a school that would teach phonics at a time when the sight method was the prevailing approach in teaching reading. JA’s success in phonics-based reading garnered quite a bit of attention around the state and set JA’s trajectory as a school recognized for its development of strong readers. Mrs. Brickell’s daughter, the late Missye Rhee Breazeale, and her husband, Don, had three children graduate from JA: Glenn (1996), Maury (1998), and Marianna Breazeale Shaw (2002). Now great grandson, Brickell Breazeale (son of Maury and wife Lauren), has an application submitted for the K3 Class of 2017-18. JA is grateful to all the founding families who worked together to bring about a school that develops enthusiastic readers, as well as individuals of character and academic achievement. 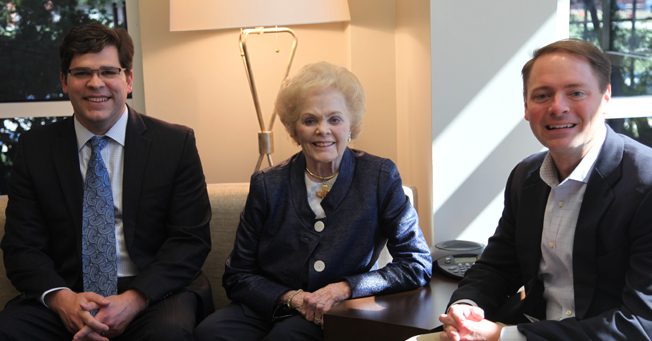 While at JA, Mrs. Brickell visited with President Cliff Kling and President Emeritus Peter Jernberg.